Please note that the content of this book primarily consists of articles available from Wikipedia or other free sources online. 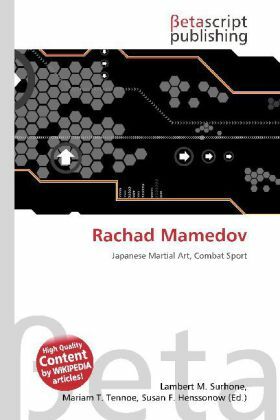 Rachad Mamedov (born 23 July 1974) is an Belarusian judoka. Judo or J d is a modern Japanese martial art (gendai bud ) and combat sport, that originated in Japan in the late nineteenth century. Its most prominent feature is its competitive element, where the object is to either throw one''s opponent to the ground, immobilize or otherwise subdue one''s opponent with a grappling maneuver, or force an opponent to submit by joint locking the elbow or by executing a choke. Strikes and thrusts (by hands and feet) as well as weapons defences are a part of judo, but only in pre-arranged forms (kata) and are not allowed in judo competition or free practice (randori).